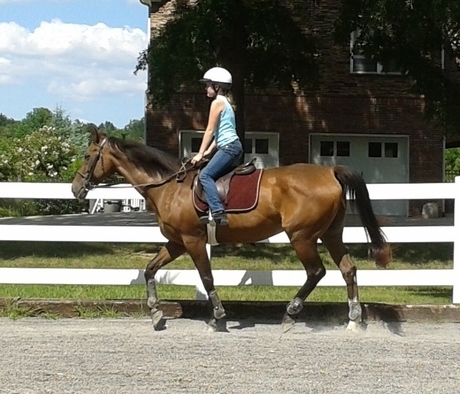 At Locust Run Stables we are dedicated to providing the highest quality riding lessons in the Clarksville, TN area. From start to finish safety, fun, and customer satisfaction are our goals. We offer private, semi-private, and group lessons for ages 8 and up. We are now also offering toddler lessons for ages 3-7. Toddler lessons are a shorter, scaled down version of our regular lessons. With a variety of horses to choose from, we are able to match the size and abilities of each rider to a horse which will provide the best riding experience possible. Lessons on privately owned horses are also available. Mrs. Rebecca Brown is the primary riding instructor at Locust Run Stables. She is certified to teach both english and western riding by the Certified Horsemanship Association. By selecting a riding instructor who has been certified, you are ensured that the individual has undergone a rigorous training and evaluation process, and has met a high standard to become certified. We run a safety-based program following the guidelines of the Certified Horsemanship Association. All riders are required to wear approved helmets, boots with at least a 1/2 inch heel, and long pants. Safety is strongly emphasized in all aspects of the riding program. click on the drop down to see what to wear. The program of instruction at Locust Run Stables provides for goal-setting and advancement of riders abilities in a structured format. This allows the instructor and rider to decide the pace and objectives for each lesson. Incentives may be provided to encourage achievement of each riders goals.